Here’s a little titbit about Allposters.ca that I bet you didn’t know: your 2013 calendar can be secured there! To top it off, you can get bonus savings with our amazing VoucherCodes.ca exclusive code that allows you to save an extra 25% off your order with this code and which can’t be found anywhere else. Take a minute to bookmark our Allposters.ca coupon page for other rockin’ savings. 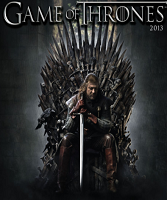 Get ready for the anticipated return of Game of Thrones, Season 3 with this 2013 calendar that you can find by clicking here. Already reduced to $11.99, you can pick it up so it can claim a space on your wall for only $8.99. Winter may be coming, but you can help ease into it with this calendar. Are you one of the few who are not into this epic TV series (shame on you!)? Check out the Sports Illustrated swimsuit edition for $7.49 after using our exclusive code. There’s no time to waste, so what will you be shopping for?